Did you know...? 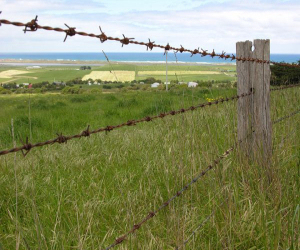 In the 19th Century, rural homesteaders created their own telephone systems using barbed wire fences to transmit signals, and it worked pretty well. An Omaha woman took a selfie every day for 365 days. Eight years later, she found that those photos were being used in a variety of ways she never imagined or intended. Read the interesting story of how Elisabeth Percival got memed, and became the face of Cool Girl Callie. How far would you go to get free WiFi? A man from Plymouth, England set up his 32-inch TV and a PlayStation 4 gaming rig inside a local McDonald's restaurant. The manager didn't seem to mind, but asked only that he refrain from playing Grand Theft Auto. In a recent interview with Bloomberg Business, billionaire Microsoft founder Bill Gates said he regrets the Ctrl-Alt-Delete "three-finger salute" was necessary to restart a computer. If he could do it over, the reset key would be a one-finger operation. Microsoft Excel is about to get a lot smarter and more powerful. New data types will better interpret what your input means in the context of a worksheet, and be able to pull additional info from the Internet. "More is Less." Twitter plans to double the length of Tweets to 280 characters, apparently forgetting that the original idea was to limit quantity to improve quality. AT&T is expanding its rural wireless Internet program to nine more states. Former Google engineer and accused trade secrets thief Anthony Levandowski has founded a church whose god is an AI bot. The "Way of the Future" was ostensibly organized to “develop and promote the realization of a Godhead based on Artificial Intelligence.” Or is it just a tax dodge? Tiny metal robots controlled by magnets scurry about and use origami techniques to change their tool sets. Swarms of half-milimeter robots can build large structures that are sturdier than 3D-printed shapes. Most recent comments on "Geekly Update - 04 October 2017"
With all the phones around now a days it's good that technology has advanced. Imagine having to deal with barbed wire coming off all the phones today. Haha. thank you! had read an article in pop sci as a kid referring to this idea. We are a crazy, inventive people. Thanks Bob. Read the whole article at the above link. It's interesting and fascinating to know, just how humans can adapt to different situations. With regard to the barb wire telephony, they only used one wire to save money. They drove a metal rod into the ground to take care of the return path. Worked quite well, and the community telephony systems were called Mutuals. Is it really a bad thing that it takes more than a single key press to restart a computer? I don't think so. There's plenty in the world of computers that Bill Gates should regret, but Ctrl-Alt-Del is pretty low on the list. Sorry, you got the control-alt-delete story wrong. Gates regrets that combination was needed to *login* to Windows NT - not to reset it. I definitely would *not* like any simple or one-key operation to reset the computer. I have enough trouble remembering to click the save button every once in a while. Just imagine the chaos if some easily hit special key reset the computer without further notice. Without regard to whether the C-A-D article referred to login or reset, a single keystroke for either would be probably receive significantly more coarse language then the 3 finger one does. Imagine the number of accidental activations which would have occurred to this point. It's just as well that the reset command has always been the simultaneous pressing of three buttons. Consider how much fun we have with 'Caps Lock'. I have no problems with the 3-finger salute that has been re-purposed in later releases of Windows OS. I am not the SHOUTING type; so, I do hate the CapsLock key and usually disable it(keyboard remap) in all my keyboards.